This prestigious building built especially for guests just at the entrance to the Balcons area of Val Thorens, exclusively for our three chalets and the owners’ private apartment. The location is ideal, close by the Plein Sud blue piste which runs down through the village, and you can ski or walk the 100m from the door across to the piste. Then just ski straight to your choice of ski-lifts in the resort centre,or keep right on skiing, down towards Les Menuires. 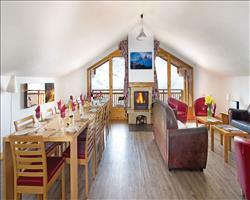 The chalet is built into the mountain-side, with the entrance on the top floor and a shared staircase to the chalets, each individually run and hosted. The chalet interiors have been individually designed to offer comfortable and stylish accommodation, with all bedrooms having en suite facilities, hairdryer and some also with balcony. A shared Wellness Spa with a sauna and steam-room for all guests is situated on the third floor and offers a peaceful and relaxing sanctuary after a full day on the slopes. Entrance to chalet, living/dining area with balcony and log-burning stove. Internal stairs to 4th floor for Rooms 3&4. We update Chalet Chloe's details often, but facilities do change. e.g. some extras listed by the supplier as "free" or included might only be for the first time you use them, or for one time per party, then charged for further use. If any specific feature is essential to your holiday, make sure you ask us to confirm the details of it before you book your holiday. This package holiday to Chalet Chloe in Val Thorens, France departs Sunday 22nd December 2019, for a 7 night stay on a "catered chalet" board basis. A local tourist tax (Taxe de Sejour or Kurtaxe) is levied by many councils in European ski resorts. It varies by standard and type of accommodation and is age dependent, so not everyone is charged. It's not included in the basic price of your holiday and is usually paid locally. For reference, the average charged in winter 15/16 was between 50p and £2 per person, per night. Val Thorens lift pass price last reported as €208 (Adult 6 day). Ask for a quote when booking Chalet Chloe. Chalet Olivier Val Thorens France, Stansted to Chambéry 22nd December. "Views, 1 min from piste, sauna, a winner"
Chalet Chloe is located on the third floor making the views spectacular from the large living/dining area with its balcony. Within 100m of the Plein Sud run, you will be up the mountain and out skiing in no time. The chalet has a sauna and wellness spa on your floor with easy access but do check before booking what's included within your holiday package. The chalet is modern with its high beam ceilings creating a homely feel and making this the perfect place to enjoy what is widely accepted as a world-top-ten resort.